Get to grips with how things work inside hundreds of machines with this extraordinary book that explains the science behind technologies and inventions. In this extensive encyclopedia packed full of simple science for kids, David Macaulay's beautiful illustrations show the inner workings of each machine from clocks and watches, to jet engines and the internet. From the basic lever to the modern microprocessor, this bestseller has been completely updated with the latest technologies, and explains every machine you've ever wanted to understand, and some you've probably never thought about. 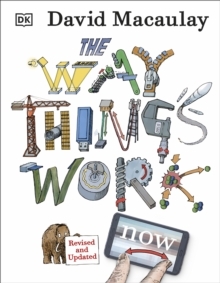 With David Macaulay's inspired illustrations and humorous approach, The Way Things Work makes even the most complex technology fun, fascinating, and accessible for children of all ages.